It doesn’t take much to start investing in dividend income stocks these days. For as little as , you can invest in partial shares of a dividend stock from a LOYAL3 account. Top dividend paying companies like Target (TGT), Dr Pepper Snapple (DPS), and McDonald’s (MCD) can all be purchased through this broker at $10 (or more) per transaction! As simple as it is to start investing through brokers like LOYAL3 and Robinhood … $10 trades are not going to grow that fast. Don’t get me wrong … this is a great way to get started – but sometimes it helps to get a kick-start with a large lump sum investment. 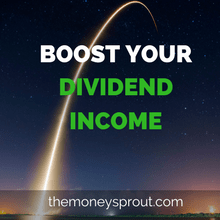 When it comes to our dividend stock portfolio (The Money Sprout Index) … we typically use our annual tax refund (usually over $5,000) to give our income stream a boost. 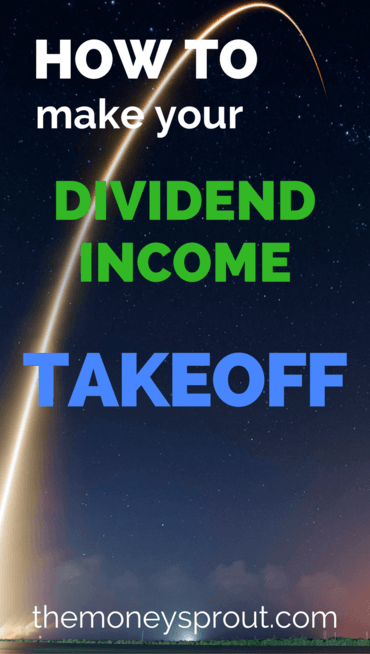 One of the best opportunities (that I know of) for giving your dividend income a boost … is to invest your tax refund. Of course, that assumes you are getting a tax refund back. Unfortunately, if you are getting any money back on your taxes … you are giving the government an interest free loan. So ideally, in a perfect world you shouldn’t get back any tax refund, but that is a topic for a different post. For the 3rd straight year, our family will be getting back over $5,000 on our state and federal refund combined. And for the 3rd straight year … we plan to invest at least $5,000 of it. This kind lump sum investment will certainly help boost our annual dividend income for years to come. Investing our tax refund this year will give our future dividend income a big jump. If we were to invest the $5,000 into a variety of different dividend stocks, our annual income could increase by well over $100. Let’s assume we invest the entire $5K into one of our absolute favorite dividend stocks – Johnson & Johnson (JNJ). At the time of this writing, the company is paying $3.20 per share in annual dividends … which is a current yield around 2.6%. Note – This hypothetical trade would be placed in our Robinhood account. This means no commissions or fees and no partial shares. With a annual dividend of $3.20 per share, we would have the potential to generate an additional $128.00 over the next 12 months. The awesome thing about investing in quality dividend stocks, is that they continue to pay you year after year. On top of that, they usually give you a raise each year so the income grows and grows. Just look at how consistent that dividend growth has been for JNJ! It seems safe to assume that the company should be able to continue raising annual dividends by at least 6.0% for the foreseeable future. We look to buy stocks that have a a minimum 5-year and 10-year DGR of 6.0% or higher. Note – Keep in mind this is just a hypothetical trade of a stock that currently yields 2.6% and has a 5 year DGR of 6.0%. These calculations are not a guarantee return on investment. Since we would be making this purchase in our Robinhood account, we would not be using DRiP. So no new shares would be purchased from our dividend payments. Over the course of 5 years, our potential trade would earn us around $721.60 in dividend income. While no DRiP shares would be purchased with this money, we would certainly reinvest it in another stock to compound our income earning potential. Earning over $700 in 5 years would give us a return of 14.6% on our purchase price – just in dividends. If the company is raising its dividend by 6%+ per year … then almost certainly their share price would rise too. Whether we decide to invest our tax refund in shares of Johnson & Johnson or another quality dividend stock doesn’t matter. Putting our sizeable tax refund to work for us earning more income is really what matters. We could decide to invest the entire amount in JNJ shares or maybe Aflac (AFL) or even Microsoft (MSFT). Taking advantage of these opportunities to put our money to work is what is important. Using a tax refund (like we have done) may just be what you need to get your dividend income portfolio off the ground! Do you take advantage of investing large sums of money like a tax refund? Do you invest in dividend stocks, real estate, or some other asset? Full Disclosure – At the time of this writing, we owned shares in the following stocks noted in this post – AFL, DPS, JNJ, MCD, MSFT, & TGT. The material above is not a recommendation to buy. Please do your own research on a company before deciding to invest.